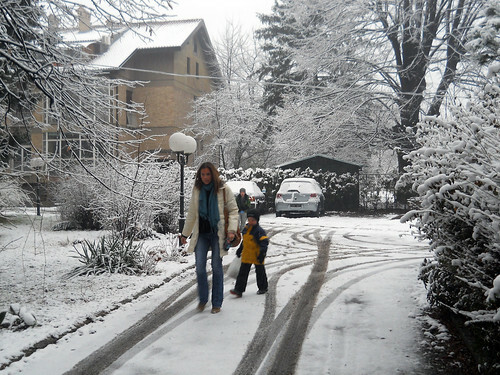 Yesterday Belgrade received a decent snow! It was only the second snowfall of the winter, the first being right before we left for Bahrain, on December 18th. I can’t wait to go outside and play with the kids today! I will definitely be posting photos our our family winter fun. Nadia, Oliver, and Owen are shown above walking to the car. Our new apartment building is in the background. We will be finishing our move this weekend also (hopefully). We moved suburbs, going from Senjak to Dedinje. The suburb of Dedinje, which means “Old Man’s HIll” (note that deda is grandfather or old man in Serbian), is the most exclusive, and in my opinion, the most interesting neighborhood in Belgrade. The area reminds me somewhat of Gross Pointe, in suburban Detroit. That is a nice thing about teaching overseas – educators can live in the nicest neighborhoods in the city. In the US, our middle class salaries put us in more modest areas. As you can read from my blog Matt, I agree! Belgrade is the capital of the region in my opinion, despite Bucharest, Sofia, and Athens being in the EU, Belgrade is the best place to live in Balkans. The food is getting better, and as the Belgraders advance more towards Europe and the rest of the world, the cuisine will reflect a lighter nature. Good luck with the apartment rentals. The real estate market here is crazy.